The summer of 1970 after I had been living and working in London for over a year, my friend Pam came over to Europe to travel with me. We had no money, so we decided to rent cheap backpacks and very basic camping equipment and hitchhike from Paris to the islands of Majorca and Ibiza and back. We had heard that these were cool destinations but knew nothing more about them. With only the idea that we wanted to head west, Pam and I took the Metro to Porte d’Italie and stuck out our thumbs. 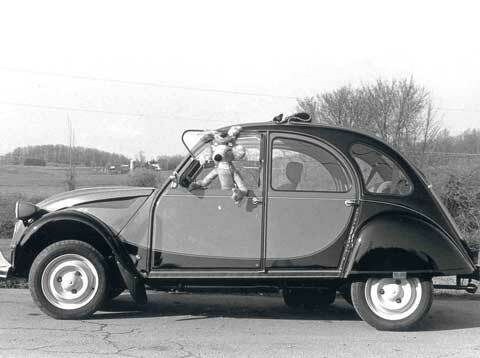 After a very few minutes, along came a Deux Chevaux, driven by a young man. We were congratulating ourselves on being picked up so quickly as we jumped into the strange little car, the two-horsepower answer to post-war poverty in France. We hurried to put our bulging packpacks into the back seat and I squeezed in beside them; Pam climbed into the front seat. It was probably our first ride in such a car. The seats were made of canvas and slung from metal bars like an old-fashioned beach chair—no padding, no insulation, and no comfort. About thirty seconds later I was sitting in the backseat feeling amazed at our luck when Pam turned around with a stricken look on her face. “Susie, he doesn’t have any pants on,” she hissed. I started laughing uncontrollably, my usual reaction when I was in shock. I could see nothing but the driver’s head, shirt-clad shoulders, and the back of his canvas seat. “Nous descendons (we’re getting out),” I cried gaily to the backs of their heads through my gales of laughter. “Deja? (Already? )” said our benefactor. One block later we were back on a street corner with our bundles and bags. Pam was furious. I was trying hard to empathize and stop laughing, but I had seen nothing! This was only the first of several adventures on that trip. Susan, What a neat little vignette. I’m laughing right along with you over your misadventure. Not ever having been to France, I guess that partially explains why France is France! What a great story! I’m still laughing. Perfectly captures the adventure of traveling at that age and in that era.